U.S. Secretary of State Rex Tillerson listens to a reporter's question alongside Qatar's Foreign Minister Sheikh Mohammed bin Abdulrahman Al Thani during a media availability after their meeting, in Doha, Qatar October 22, 2017. KABUL - U.S. Secretary of State Rex Tillerson paid an unannounced visit to Afghanistan on Monday for talks with Afghan leaders on the new U.S. strategy to end the war. Tillerson and U.S. General John Nicholson, the top American commander in Afghanistan, met for about one hour with Afghan President Ashraf Ghani and Chief Executive Abdullah at Bagram Air Field outside Kabul. 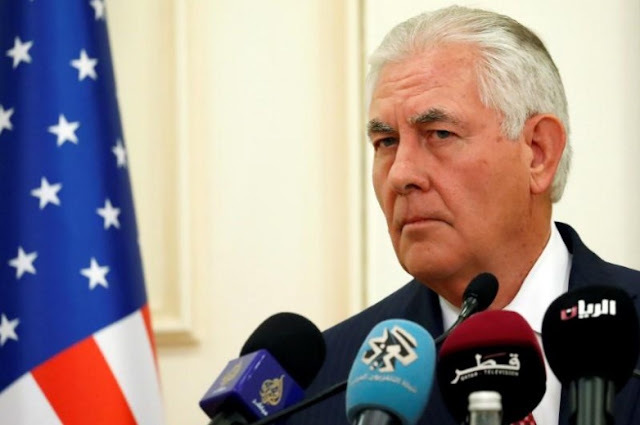 Tillerson said he will visit Pakistan on Tuesday to discuss U.S. requests for specific actions against the Afghan Taliban and other extremist groups based there. He will visit India after Pakistan to discuss cooperation in Afghanistan and the wider Indo-Pacific region. U.S. Secretary of State Rex Tillerson paid an unannounced visit to Afghanistan on Monday for talks with Afghan leaders on the new U.S. strategy to end the war. Tillerson and U.S. General John Nicholson, the top American commander in Afghanistan, met for about one hour with Afghan President Ashraf Ghani and Chief Executive Abdullah at Bagram Air Field outside Kabul.